ICY SURPRISE ON MARS: In 1976, NASA's Viking 2 lander dug into the soil of Mars in search of water and came up dry. NASA has just learned that Viking 2 might have succeeded if it had dug only 4 inches deeper. Meteorites hitting the Red Planet in 2008 and 2009 have exposed subsurface deposits of ice in the general area where Viking 2 landed. According to pictures taken by the Mars Reconnaissance Orbiter, the ice is surprisingly close to the surface in easy reach of robotic landers or thirsty human explorers. Get the full story from Science@NASA. Emiel Veldhuis photographed the tower of solar plasma on Sept. 26th from his backyard observatory in Zwolle, the Netherlands. "Nice display," he says with a hint of understatement. 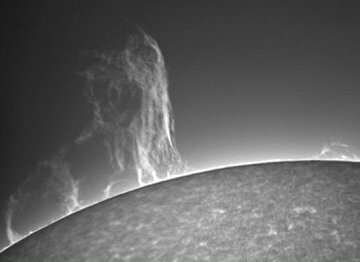 In Moers, Germany, Helmut Goell trained his Personal Solar Telescope on the monster prominence and recorded it for 90 minutes. Watch the movie and consider this: The prominence is five times taller than Earth itself, and the "plasma falls" are cascading some 64,000 km. That's solar activity. Readers with solar telescopes are encouraged to look for "proms." Italian amateur astronomer Rolando Ligustri took the picture on Sept. 26th using a 4-inch wide field Global Rent-a-Scope in New Mexico. 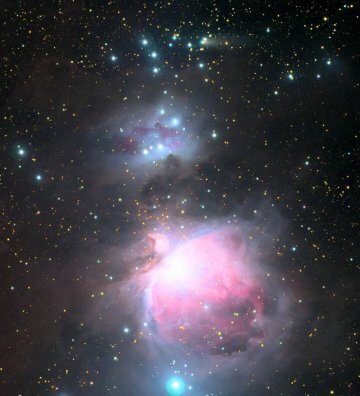 He needed 15 minutes of exposure time to reveal the green comet among the gas and dust of Orion's great star-forming region. The comet is receding from the nebula now, but still close enough for some nice parting shots. Astrophotographers who wish to try can use this JPL ephemeris to point their telescopes. Good luck! On September 27, 2009 there were 1076 potentially hazardous asteroids.